Galway city - officially, politically, and in the actions of individual people - has expressed its outrage at last week's terrorist attack in New Zealand, which left 50 people dead, while this evening, a vigil for the victims will take place in the Galway's Masjid Maryam mosque at 7.30pm. 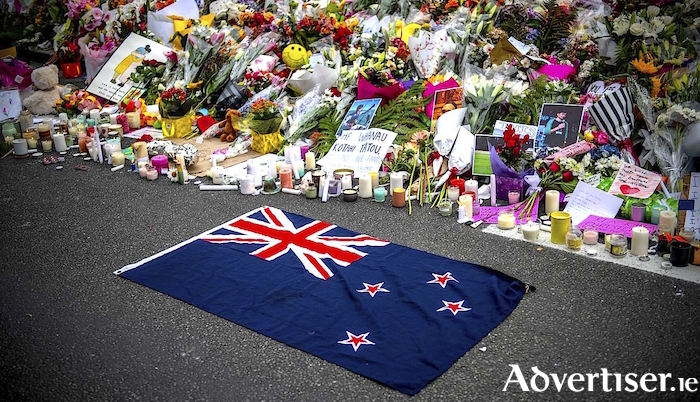 On Friday March 15, a 28-year-old Australian, armed with semi-automatic weapons, entered two mosques in Christchurch, New Zealand, killing 50 people and leaving another 50 injured. The killer was later apprehended by the police, on his way, it is understood, to what would have been a third target. Authorities have since charged the man with murder. More charges are expected. The massacre is one of the worst instances of Islamophobia, racially motivated violence, and targeting of minorities, in recent years, and has shocked and appalled the world. New Zealand prime minister Jacinda Ardern says she will refuse to use the name of the shooter, as she is determined to deny him the publicity he sought. Reaction in Galway to the Christchurch massacre was of shock, disgust, and horror. There have also been expressions of sympathy for the people of New Zealand, and particularly for its Muslim community, leading to the Mayor of Galway, Labour city councillor Niall McNelis, requesting City Hall open a book of condolence. Expressions of solidarity with Galway's Muslim population have also come from various quarters. "I want to express, on behalf of the people of Galway, our deep sense of shock at the events in New Zealand," said Mayor McNelis, "and solidarity with our Muslim communities locally. I understand how frightening and upsetting these attacks must be, even when so geographically distant." The book of condolence is available to sign at City Hall, College Road, until Friday March 29. The first signature was by Deputy Mayor of Galway, Cllr Donal Lyons, as Mayor McNelis is currently visiting Galway's sister city of Seattle. Speaking from there, Mayor McNelis told the Galway Advertiser, that last weekend in the US city held "a number of moments silences were held at official and church events". The vigil at the Masjid Maryam mosque, Old Monivea Road, is being organised by the Ahmadiyya Muslim Community Ireland, and is open to all members of the public. "We have been getting many people ringing and visiting the mosque giving condolences," Ibrahim Noonan, Imam of the Galway Ahmadiyya told the Galway Advertiser. "Many have been leaving flowers outside the mosque. One lady from New Zealand came here to visit us and she was very emotional." "We unequivocally condemn the actions of the terrorists who are the enemy of humanity," added Dr Nauman Iftikhar. "Our hearts and prayers go out to the innocent victims of the Christchurch atrocity, and our deepest condolences to the people and government of New Zealand. May God grant comfort and peace to their families in this most difficult time. We stand united with all who seek to promote peace and an end to suffering." Further expressions of solidarity with Galway's Muslim community have come from the Galway West branch of the Labour Party. "The growth of the Muslim population in Ireland has been part of a broader diversification of Irish society," said Labour Galway-West chair, Andrew Ó Baoill. "This diversity has enriched our cultural and social experiences, and has been a welcome development. "Our Muslim neighbours, whether born here or newly arrived, form part of the rich tapestry of Irish life. We in Labour, like so many others across the political spectrum, and outside of politics, condemn this violence, and reject the ideology of hate and bigotry that seeks to set us against each other."